HDR (High Dynamic Range) photography uses post-processing tools to combine a series of images and adjust the contrast ratios to produce final images impossible with a single exposure. The workflow described in this e-paper produce an enhanced photorealistic image. First I should not call it “My” workflow as it has come from a number of sources. High on the list are the tutorials by Tray Ratcliff available at www.stuckincustoms.com. Most of the techniques are shown in the 11 hour video tutorial ($89). I guess it is “My Workflow” because I have taken what I like from many sources, added to them and modified them to my liking. 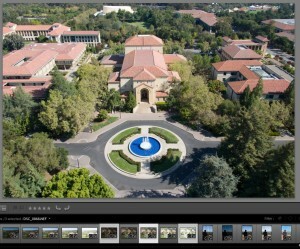 This tutorial uses Lightroom 4, Photomatix Pro 4.2.6, Adobe Bridge CS6, and Photoshop CS6. This tutorial is done in Windows. It will work fine on Apple machines with a few keystrokes changed. The techniques can be modified to replace each of the software tools with a similar tool. The “Photos” folder has nothing to do with HDR. This is where I put all of my photos. 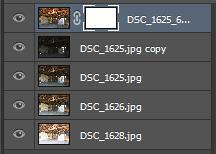 The “Photos” and “HDR PSD” folders are backed up every day. 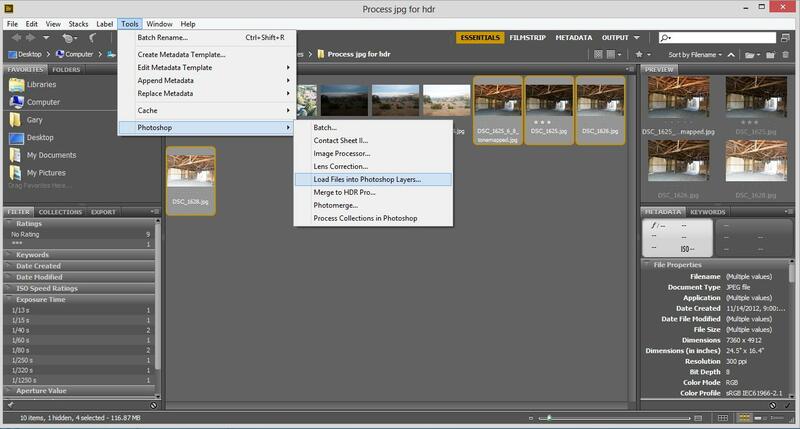 The Process JPG folder is a queue and/or work in process file. I delete the contents of the Process JPG folder after completing the HDR processing. I keep the “JPG Full Res” and “JPG For Web” folders for publication and printing. I do not back them up because I can always recreate them from the PSD files. Blend the HDR image with selected layers of the original images to correct and improve the final image. I normally use 3 images and sometimes 5 or more images. For most images 3 shots is enough, but if shooting into the sun or subjects with a very large range of light I go to 5. Each image is 2 EV apart in exposure. You must use Aperture Priority (keep the F stop constant) for the HDR series. Most cameras can do auto bracketing so taking the shots is simple. My Nikon brackets 1EV steps so for me to get +2, 0, and -2, I have to shoot 5 shots (+2, +1, 0, -1, and -2). There is a “single shot” version of HDR processing not covered in this e-paper. As each of the shots is going to be put in layers and blended, it is critical that they line up. This means a GOOD tripod and cable release. The other reason for a tripod is that often the +2 exposure time can be a long exposure and without a tripod would be blurred beyond use. If the slowest shutter speed is high enough you can hand hold shots and let the software try to line them up. I do not recommend hand holding the camera. HDR works best with subjects that have high contrast and do not move. Because of the exposure bracketing things that move can cause “ghosting” problems. Things that move include people walking around, cars, tree limbs on a windy day. There are a number of ways to deal with movement and the resulting “ghosting” effects. 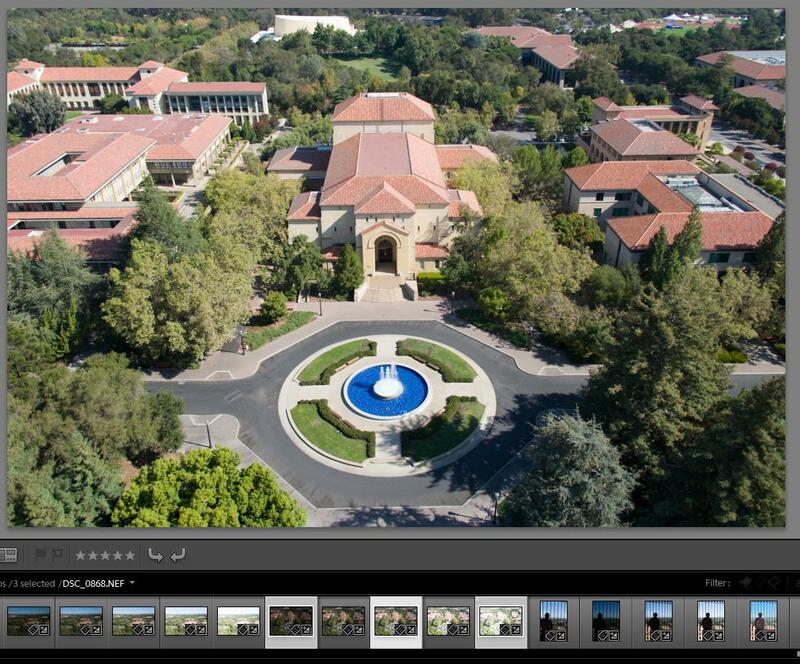 Shooting bracketed exposures is good even if you do not end up using HDR processing. It was common for “old school” photographers to bracket important shots. I only shoot RAW format and never jpg format. This gives me options that I may need latter in post processing as each RAW image has much more detail information than a jpg file. After each photo shoot I let Lightroom download the images from the camera to the “Photos” file. 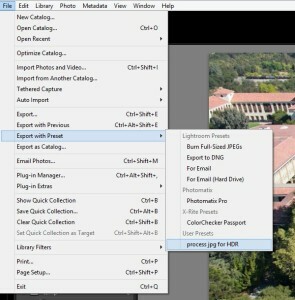 You do not need to use Lightroom but it keeps your photos organized, does a good job of processing standard photos and does a good job of exporting images in other formats. I import into Lightroom with a preset that has develop parameters close to what I need for standard photos. For HDR however I do not use any Lightroom post processing so for me this means I need to reset the settings for all HDR shots prior to exporting for HDR. In the past I tried to use my standard “Develop” settings but find that the end results are better if no Lightroom adjustments are made. 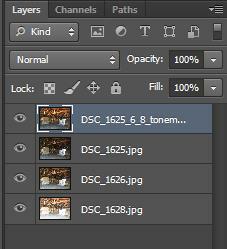 From Lightroom I select the shots that I want to process and export them as jpg files to the Process jpg folder. 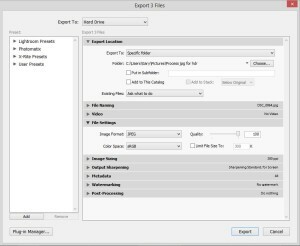 As I do this a lot, I created a preset that does the export as jpg full resolution to the Process folder. 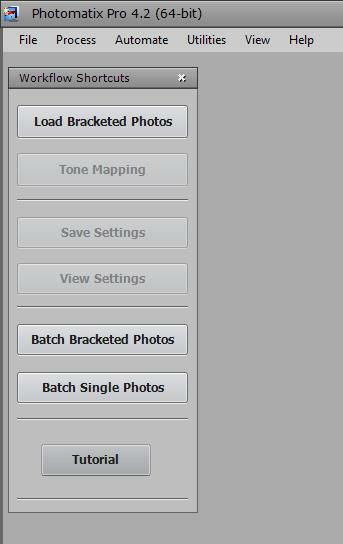 To create the preset simply click the Add button on the lower left and name it. 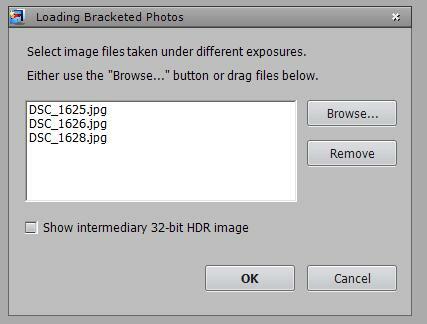 I named mine “process jpg for HDR”. These files are going to be imported into Photomatix Pro HDR software and used in Photoshop. As I preach always use RAW format, why am I now using jpg? Well I am not 100% happy with this but my understanding is that Photomatix converts any image to jpg for its internal operations. 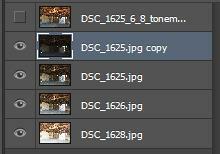 Thus I might as well use the best RAW to jpg converter out there, which is Lightroom. 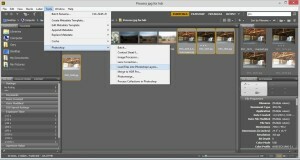 There is a Photomatix plugin for Lightroom, why not use it? The reason is that I will need to use the camera shots latter to blend back into the final image. 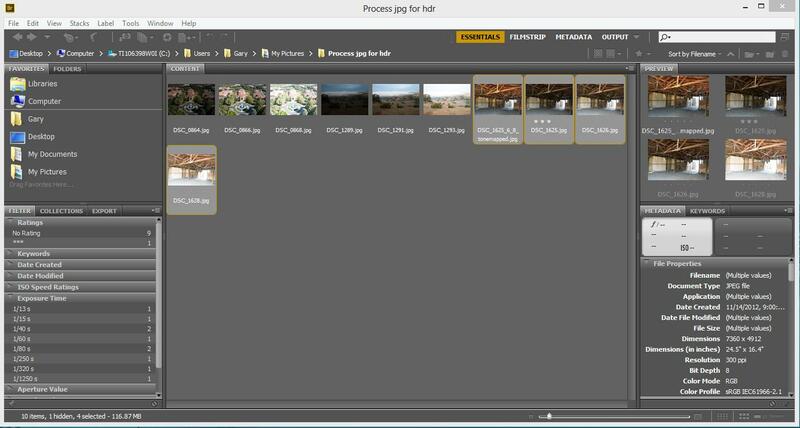 I have exported three photos each +2, 0, -2. At this point I close down Lightroom and open Photomatix. 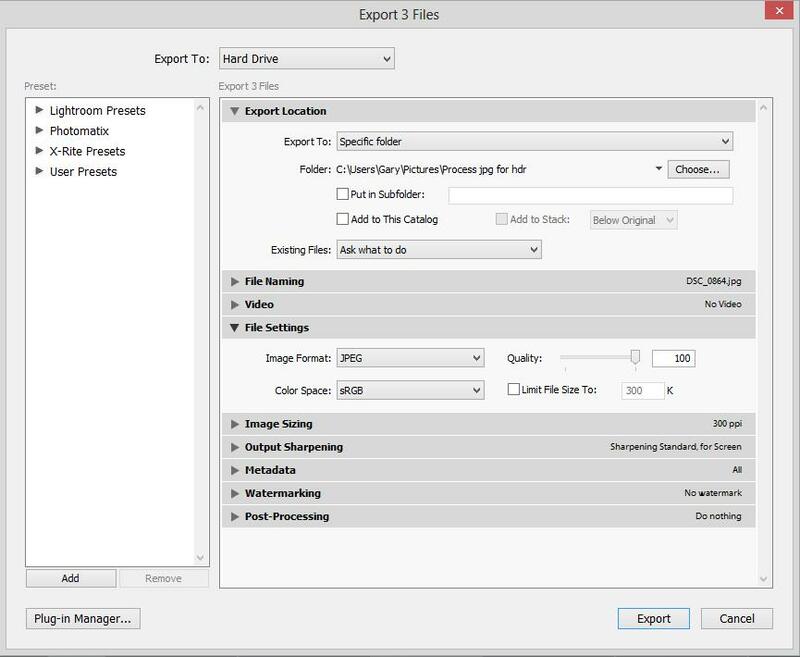 Mine comes up like this:One of the benefits of using the “standard” files is that all of the software used in this tutorial tends to remember things like the last files used which makes all of the operations going forward after the first time easy. Here I click on the Load Bracketed Photos button. And then on the Browse button. The first option is “Align source images. If you shoot from a GOOD tripod and use a cable release or the timer to avoid moving the camera you can chose to not select this option. However I have a $100 tripod and if I fail to get it really bolted down I do get a little shift. To be on the safe side I use the Align option as shown. If you shoot without the tripod you must use this option. You may need to open the Maximum shift up a bit for hand held shots. Photomatix removes ghosts or you can do it yourself in Photoshop. I find that sometimes Photomatix does a great job and other times it does not. 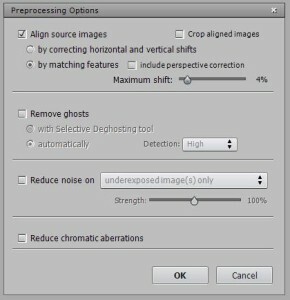 If I know there are ghosts, I generally start by selecting this option with the sub-options as shown. If I like the result great, if not I re-blend in Photoshop. 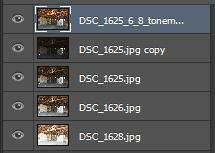 Sometimes the results are so bad I go back and redo Photomatix without this option selected – not often however. I leave it to you to read and experiment with all of the controls to find your sweet spot. I am showing you mine which are a bit different that those I have studied under and yours will be a bit different than mine! There are no universal “correct” settings and every different picture and person will use different settings. 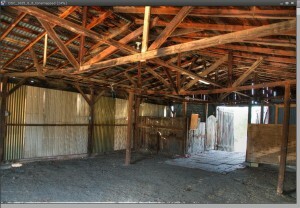 By nature, HDR processing seems to add noise or grain to parts of the photo. If my original shots are clean (like shot at ISO 100 with short exposures) I do not use the Reduce noise option. There are many ways to deal with noise latter in the workflow. If I know from the get go that I will be dealing with a lot of noise I do select the option with the sub-options as shown. When you have back lighting you run the risks of getting chromatic aberrations. These show up as colored lines along the edge of sharp dark lines with a light background. Again there are multiple ways of dealing with them. If I know there will be significant aberrations I do check this box. This slows down the pre-processing function of Photomatix a lot, so I only use it if needed. How do you know if it is needed? Process a lot of images and you will get the feel. I am sorry but there is really not a good answer. The shot below has aberrations along the post to the right of the open door. I chose not to worry about them for this exercise. If you zoom to 400% you can start to see them as magenta on the left side of the beam and green on the right side of the beam. At normal magnifications you do not see them. For most of my shots I simply click thru this screen as shown. You will learn by experimentation and practice what works for you. OK, now the first fun. Click the OK button and this is the result. You can see what my default settings. These are only the starting settings, not the final ones for any picture! Watching Tray in his video is good, for in short what he does and I have tried to adapt is start clicking one slider at a time left and right, back and forth, etc, etc until finding a spot that he likes, then moving on to the next. Over time you start to get a feel for this. It is very subjective and there is a wrong place (most of the time) and a different right for each of us and for each photo. It is good in the beginning to move the controls to the limits to see what they are all about. I personally end up with the Saturation higher, the next set of controls somewhere in the middle. If there are trees with light sky behind them I look at the area around the trees and move the Lighting and controls above to eliminate a light “band” around the edges. 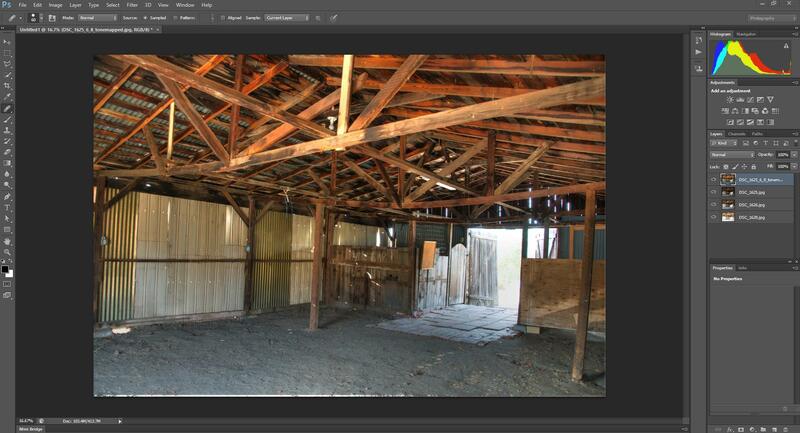 This is one thing I hate to see in HDR photos and is easy to fix at this point. I move the White Point looking at both the photo and the Histogram. I don’t mind a small amount of “blow out” on the right side of the Histogram, but again look at both the histogram and picture with more weight on the picture. The same is true of the Black Point. I frequently end up at or to the right of center for black point which is more than many of the other tutorials, but it is what I like. When I get to Micro smoothing I start by moving the slider to the far left and move back and forth from there, frequently ending up close to the left side. If there is a lot of sky in the picture and you see a lot of noise in it, moving to the right reduces it. However the picture you see at this stage is not the final picture after processing in Photomatix, so I do not get too concerned about some noise in the sky. I have said it before and will likely say it again, the setting of these controls is very subjective and I always find I like the results with the controls set at many different places. Photomatix comes with many presets and you can buy many more. Sometimes these are fun and get you into seriously strange places. I do not use them anymore. I like the results from this process without the presets. I do not like the area in the door and will darken it in Photoshop. This is an example shot that would have been better with another shot at -4EV bit I did not think of it at the time. So click the Process button and you will see the finished result from Photomatix. I still want to work on the area around the door. Also in the alignment of the layers is a little crud along the bottom edge. This will be removed in Photoshop. Clicking the “X” will close this and bring up a Save box, click “Yes” on that. The default location is back in the Process folder. Click “Save” and you will be back in the blank Photomatix screen. You can now do the same for all the other photos in your queue. I strongly suggest that you take a lot of pictures and practice processing them until you are the “Clicking King or Queen”. When finished, close Photomatix and start the final process. I have used Photoshop for years, but know very little about it. And for what I use it for, this is fine! You do not need to be an expert to use it for HDR. The more you know the better but you do not need a PhD degree in Photoshop to do what we are going to do next. In fact, you do not even need Photoshop. You can do everything in Elements at a fraction of the cost. I do not have Elements so I cannot show you how to do the things we are going to do, but with a little work on you part I am sure you can figure it out. 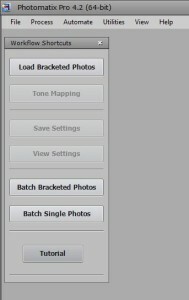 I also have Adobe Bridge and never used it until I started with this workflow. It makes things easier, but is not required. Here you see the 4 layers. You need the HDR image on top and then the 3 original files under it. I am also showing the tool bar areas to be used next. First I am going to crop the edges. Depending on the photo I might want to crop a lot more than the edges. If there is clutter around the outside of the image (things that do not support the object of the photograph) crop them out! Then I will select the brush tool. I set the Mode to Subtract and will play with the Opacity and brush size as I go. Now to work on the door problem. Turning the eye off for the top layer and selecting the dark layer I still see the door burned out. Normally at this point I will go back to Lightroom find the best image for the area I need to fix, and then modify it in the Develop module to match the area I am working on – without regard to any of the rest of this image. I typically try to match the HDR look so that blending it with the real HDR image is easy. You do not have to do this and for this tutorial I did not. So I am going to use the brightness/contrast control and really darken this layer only being concerned about the area around the door. It is good practice to duplicate a layer before messing with it so I do this by right clicking on the layer and select Duplicate layer. The first icon in the Adjustments box is the Brightness/Contrast. Clicking this brings up the Properties as shown here. Again all I am interested in is the area around the door so I push the Brightness all the way to the left. Another way to do this is to go back to Lightroom and go to the darkest exposure and tweak it to get the best results for the blown out door area. But for this example I will use Photoshop. 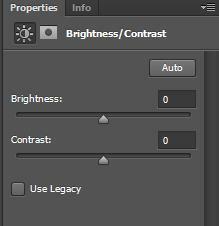 After making the Brightness adjustment, right click on the adjustment layer and select Merge Down. Now we have created a layer just below the HDR layer that has more detail in the door area. 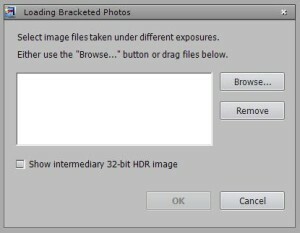 Now click on the HDR layer and enable it (click the eye box). Before going forward it is very important that the two layers are exactly aligned. This is easy to do. Control click the two layers to select them and then click on the top menu “Edit” Under this you will see “Auto Align Layers”. Click on “Auto” and “OK”. Presto the two layers are perfectly aligned. Things should look like the second set of layers above. Now go to the bottom right panel shown below and click on the rectangle with a circle in the middle (third from the right). This will create a layer mask next to the HDR image. Now the magic of layers in Photoshop come to life! Imagine you are looking down through the HDR layer to the layer below. At first you cannot see through the HDR layer. But as you paint over the image (large image, not the icon) you start to poke through and can start seeing the layer below. By setting the Opacity to a low number you only see a bit. However you can click multiple times and each time you see more. In this example I have it set to 19%. Being sure the mask is selected by clicking on it (the white box) I then move the cursor over the door area. I see a circle. To adjust the size use the keyboard “[“ for smaller and “]” for larger. Using a larger brush I paint (hold down left mouse button and move over the area. As you do this you will see the area get darker as the layer below starts to show through. There are many techniques for brushing. One is to hold the brush still over an area and then click several times burning in a bit more with each click. Another is to hold the left mouse down and move it around an area the click again and repeat. With practice you get good. Note that in the white box you can see the area you have poke through. Also you can hit the “\” key and the area will turn pink. The darker pink the more you have poked through. Hit it again to turn the pink off. Complete this step by merging the two layers (select both, right click and select Merge layers). In this photo this is the only adjustment I am going to make. This varies from photo to photo. If there is a ghost to be removed use the same technique. 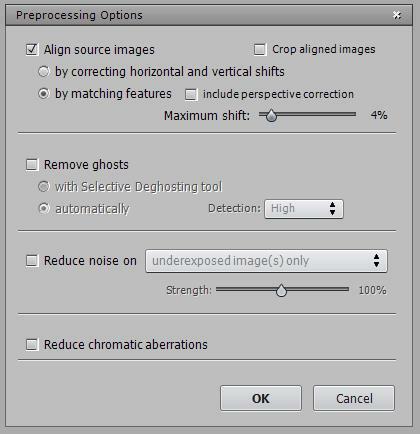 Put the original image below the HDR, adjust the brightness to match the HDR, auto align them, then create a mask and poke through the ghost until you only see the single image from the lower layer. This can be done in steps: Fist set opacity to 100 and the brush small, paint the ghost away, set the opacity to 15 to 20 and the brush larger, blend the area around the ghost. You can repeating this step with a larger brush and opacity to 10 or lower to obtain a seamless blend. Often I use several of the original images in subsequent steps. 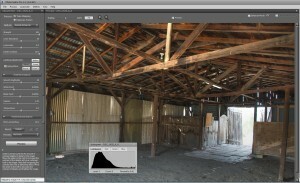 Remember you are always working on the HDR layer and the one below. You can move the layers around by clicking and hold and then drag the layer to a new position. Sometimes I sharpen the finish image in Photoshop. You can use the build in tool (I normally do) by clicking on Filter, Sharpen, and Unsharp Mask. Play with the three sliders. For landscape shots I adjust the Radius while watching the image. I “play” with the three sliders to get the best result. I mostly look at the big picture for the top two sliders and then the small enlarged picture to set the Threshold to the lowest number with acceptable noise. Do not over due this or it will look bad! For the example print here I ended up with 140%, Radius 8.0, and Threshold at 17. There is also a built in filter to reduce noise. I use it on some photos to clean up noise. There are many third party plug-ins for Photoshop. Some that do great things like noise reduction or image sharpening. They cost money but preform very well in some situations. Some of these include Nik software, OnOne software, Topaz Adjust, and Noise Ninja. It is only money after all! Speaking of, I do not have discount coupons for these products as of yet, but Tray does on his StuckinCustoms web site. He also has reviews of these and many more. The next thing to do is to save all this work. First I do a “Save as” and put the Photoshop native PSD file in the folder HDR PSDs. Then I do a “Save as” and put a maximum size jpg file in the JPG Full Res folder. Then I do a “Save for Web” and adjust the quality to get a file around 7M and save this in the JPG for Web folder. Some people will make this ever smaller. I then publish the small file on Facebook and the larger files on Google Plus and Smugmug. My camera is a 37MP guy and the larger files are around 35M in size. The last word of advice (yes): practice, practice, practice. Read every free tutorial and if you have the money get some of the ones you have to pay for (again, I got a lot out of the $89 video done by Tray Ratcliff (stuckincustoms.com). In that video he processes a lot of images so you see the workflow many times with different images and situations. He also covers using some Plug-ins and “double tone mapping”. Do publish your pictures at least on one social site and brace for comments. Criticism help you grow but do not take it too seriously as it is another person’s opinion and may be true for that person and not for you! There may be errors in this and better ways to do many of the operations. I always appreciate feedback!